Posted April 14th, 2014 . Nice to see dog owners not give up on their dogs just because they had children (and even if the dog does not like their children). There are still ways to love your dog and your children at the same time without having to give up your dog. I love it. That is too funny. We had a couple “first babies” dethroned by three kids and they never seemed to get over it. THEY DO REMEMBER….AND ARE SUCH BABIES THEMSELVES. BUT AS ONE KNOWS, THEY ARE FOR LIFE AS WELL….AND THERE IS ALWAYS ROOM FOR MORE LOVE! My story too – except it was a chow/golden mix. My daughter cried just as hard as I did when he passed, and now remembers him as the BEST DOG EVER. The family who adopted this dog made a decision to keep them for life! Responsible pet owners don’t adopt them on whims to be discarded when we move, get married, have children etc. If you want a low-maintenance pet I suggest a rock. Sheesh, and here´s me thinking that the CHILDREN should be the priority of any family.. even over household pets. We got our rescue after her first family said they had too many kids and could take care of her anymore. Their loss was our gain. She was the sweetest dog. I applaud the doggy’s owners for putting in the effort in to keep the dog away from their son, AND not tossing him (the dog) in the pound. I see so many older dogs up for adoption because they didn’t fit into the household anymore…..it’s sad. The negative messages on this board are distasteful. And yeah, i think the photo is funny. Agreed with in the heartiest sense. My chis are scared of kids too, but this is so funny. Not so Precious. I think its great. It’s easier to separate 2 dogs than it is to separate 2 kids. I’ll take 2 dogs anyday. I have a 6 pound Pomeranian and a 29 pound 2 year old..they didn’t get along at first…but they have found common ground. When I caught the 2 year old trying to poke the dog in the eye..I saw the dog gently biting the 2 year old’s finger as if to say “C’mon tiny human…enough already!”..a lesson in patience and redirection. So “small dogs” can make very good “big sisters!” I for one found “Precious” to be absolutely hysterical! I prefer dogs over children ANYday. This is so cute, I’m glad they love their dog. Don’t pay attention to the grumpy people! We own four JRTs and they are all sweet loving dogs so stop labeling them! Let’s just keep the negative comments to a minimum. This is a website dedicated to making people laugh. If you have nothing nice to say, please keep it to yourself. Thanks to mostly everyone for making this website great! Wag more, bark less, people. I have my own, not so precious – he is a JRT – he came AFTER my husband, AFTER my GSD and AFTER my son, and guess what, he thought he should be the center of attention! We have learned to live with him, read the signs and leave him alone when we need to. Oh yeah, we love him to bits. He is the cranky uncle of the family. Sometimes we can kiss and hug him and sometimes not! Its not about putting one over the other, its about making your family work! Yes, it is the first baby and sometimes the only one. You are a truly heartless person if you think dogs and cats are disposable once a human child comes along. You sir, are on the wrong website! Obviously someone who has never loved a dog…………. 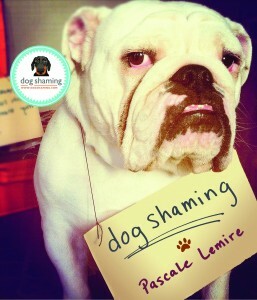 Whew, nice to see the “dog shaming” fairy has swooped in and corrected all that’s wrong with the world! This post is freaking hysterical!!!!!!! Love it! I loved this, it was hilarious. I had a mean kitty that passed away two yeas ago. She was hilarious, the 6 adjectives fit her purrfect, except for one, she didn’t stink. It brought back memories, I really miss her. She wanted to love on you, but you couldn’t love on her. Thanks for making me laugh! I used to teach elementary school (5th grade and 3rd grade), and I would’ve asked the student if I could post this in the classroom. 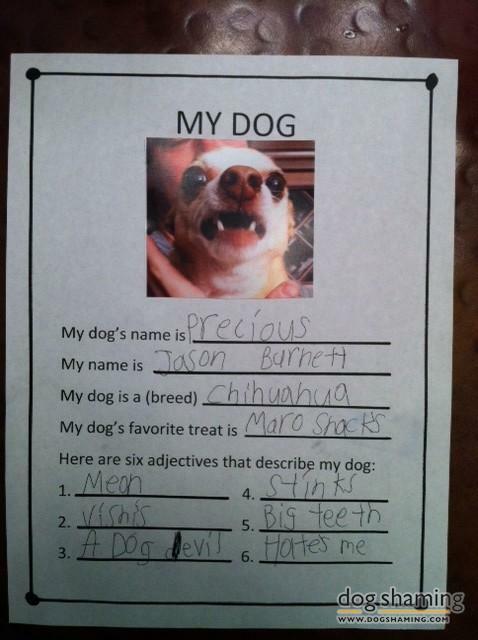 Absolutely hysterical, and bonus points for creativity – I think ‘dog devil’ is particularly hilarious, and the accompanying picture is great. When I read this yesterday, I almost had to shut my office door I was laughing so hard. Chihuahuas are the cats of the dog world. Sorry… before I raised a child in this environment, the dog would be in a new home where child and dog would be happy, no matter how much, but because I loved the dog and the child….